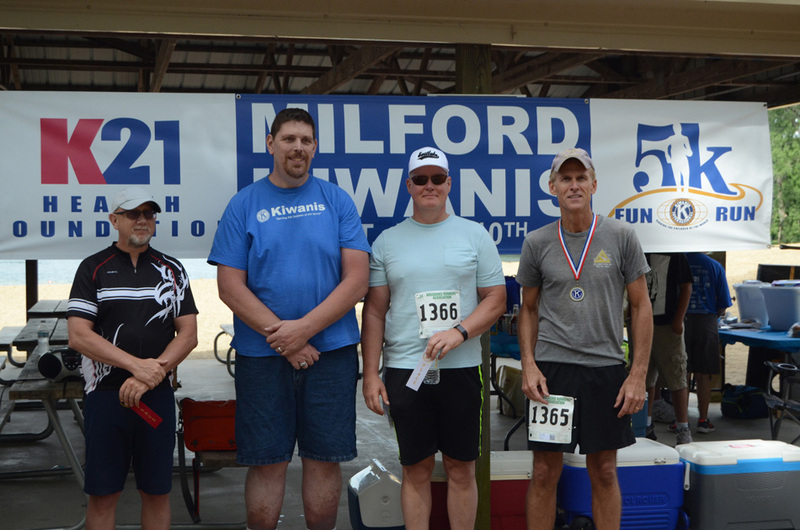 MILFORD — This year’s third annual Kiwanis 5K Walk and Run was an extra special affair, as participants stuck around after the race for the dedication of some new playground equipment at Waubee Lake Park Saturday. The dedication of the playground equipment — which was made possible by a partnership between the town of Milford, the Kiwanis Club and the K21 Health Foundation — seemed a natural fit since both the new playground and the race shared sponsors as well as the fact that both were intended to promote the health and fitness of area residents. The Milford Kiwanis first partnered with K21 when a member of both organizations, Becky Alles, suggested the former reach out to the latter a couple of years ago, said Saturday’s event organizer Paula Stokes. When the subject of new playground equipment at Waubee Lake Park was raised, K21 agreed to match the Kiwanis and the town of Milford on a two-for-one scale so long as they could jointly raise $20,000. They did, and the fruit of those efforts was a $60k upgrade to the playground at the park. “They’re an organization that likes to support healthy things in Kosciusko County, so we just put a request in, and they granted us some funds. 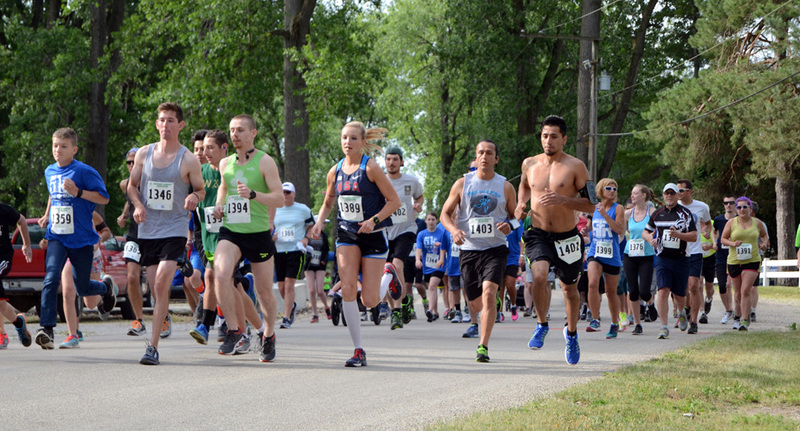 From there, we get sponsors throughout the community to help, and we do charge the runners a small entry fee,” explained Stokes of the partnership with K21 and the race. “They’ve supported us the last two years. This is just kind of an extended celebration today because of the playground equipment and the 5K. Volunteers set up the pavilion prior to sign-up Saturday. 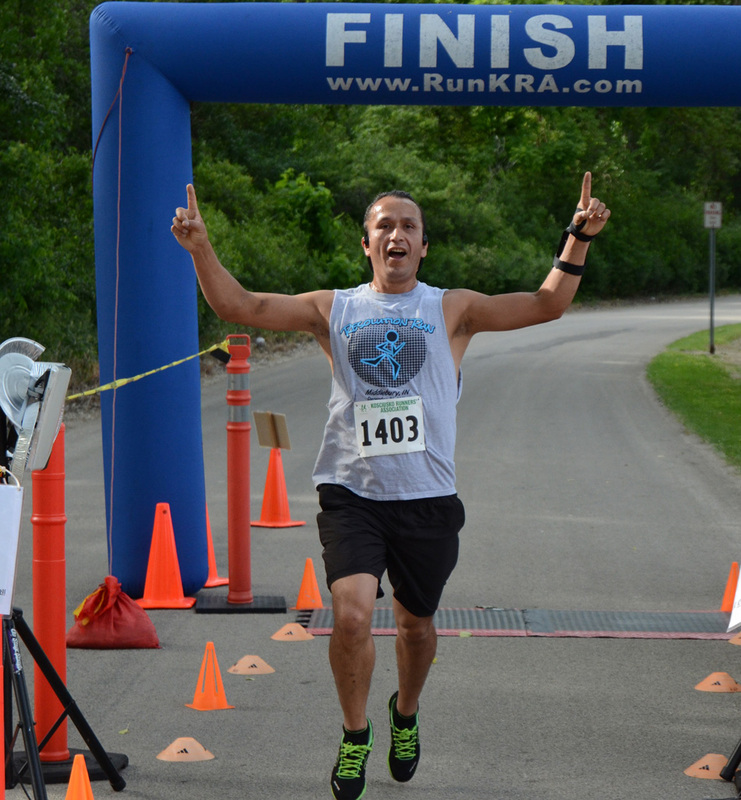 While runners were charged an entry fee for Saturday’s race — money which goes back to Milford Kiwanis Club projects like Riley Children’s Hospital, New Beginnings Preschool and Child Care, Harvest with a Heart Charity Garden Market and the Rock Solid Teen Center in Syracuse — two runners made those fees back and then some. Overall men’s winner Adam Doll and overall women’s winner Amy Walker were both awarded $50 for their efforts in the 5k run. Doll, a 21-year-old North Webster resident, crossed the finish line in 18:29.10. The Wawasee cross country alum looked fairly comfortable after his run and conditions were cool in the early morning hours on Waubee Lake, but former Warriors CC teammate Thunder Olsen — who won the men’s 20-29 age group and finished fourth overall Saturday — still doused the good-natured Doll with a little celebratory bottled water following the win. It was a low mileage day for Doll, who says he’s training for a marathon in October and runs six miles every other day. Conditions were also good for a run with cool temperatures and a breeze coming off the lake. “It is good. Not too warm, a little windy,” said Doll after the race. 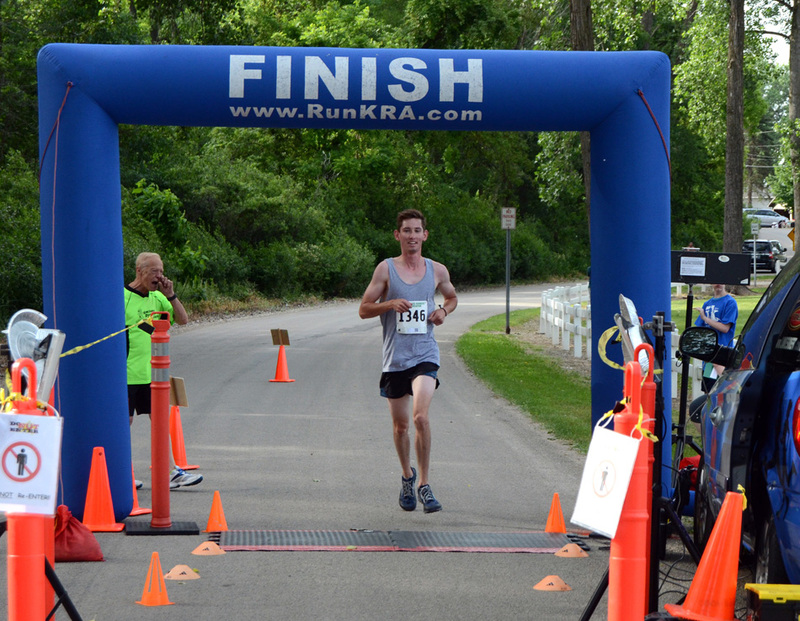 Overall men’s winner Adam Doll crosses the finish line. Walker, a 24-year-old Milford native, came all the way from Indianapolis when she was told by former neighbors about Saturday’s race. She clocked a 21:01.32 time in a run she dedicated to the memory of her grandfather, who was himself a Milford Kiwanis Club member. “My grandpa passed away a few years ago, and I know he would be here cheering people on, so I like coming and doing stuff like this in the Kiwanis because I know he would like to do it, and he would love that I was here,” said Walker. 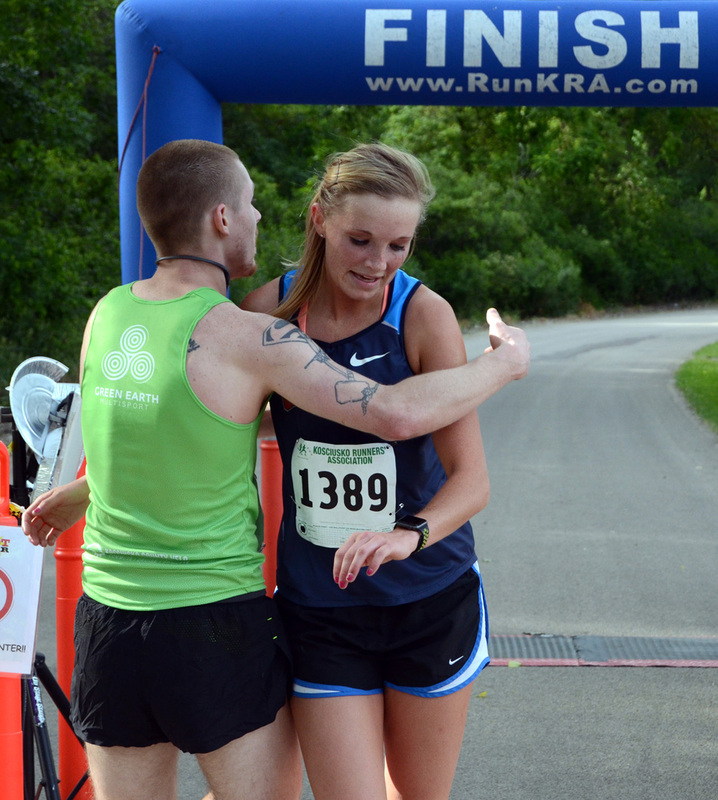 Overall women’s winner Amy Walker and men’s 20-29 division winner Thunder Olsen hug after Walker finishes up Saturday. Volunteers served food after the race, and ribbons and medals were presented to top finishers in each division. While Doll was the first overall men’s finisher, and Olsen won the men’s 20-29 category, F.G. Garcia was first in the men’s 30-39 group, Hermelio Garcia was tops in the men’s 40-49 division, Fernando Hernandez won the men’s 15-19 group, Craig Meller was the men’s 50-59 top finisher, John Blakelsee was the men’s 60-99 winner, Dominic Speybroeck won the boys 10-14 age group, and Carter Stokes was the boys 1-9 winner. On the women’s side behind Walker, Zoe Gingerich was the top 20-29 finisher, Yuko Baumann was the 40-49 winner, Mandy Vetor was the 30-39 winner, Jane Carlson-Miller won the 60-99 age group, Jacqualynn Green was tops in the girls 10-14 division, Susan Snyder paced the 50-59 group, and Alyssa Smith finished first in the 15-19 group. Hermelio Garcia celebrates after winning the men’s 40-49 division. 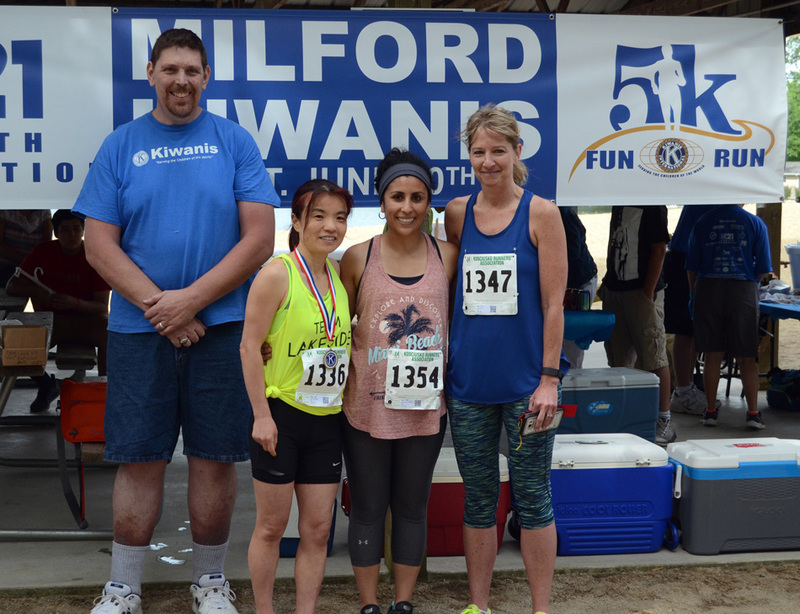 Yuko Baumann, Sarita Hernandez and Julie Doll pose for a group photo alongside Kiwanis Club President James Newswanger after earning the top three spots in the women’s 40-49 group. Craig Meller, Timothy Miller and John Debolt pose for an awards photo after claiming the top three spots in the men’s 50-59 division.